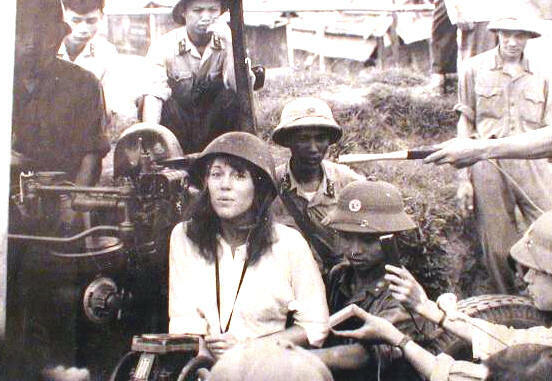 Jane Fonda also participated in a staged press conference with American servicemen held captive by the Viet Cong, the purpose of which was to "prove" that the POWs were not being mistreated by their captors. Years later when the released POWs described the very real torture and degradation they suffered at the hands of the North Vietnamese, Fonda called them "hypocrites and liars." Fonda's behavior at that time, considered treasonous by some, earned her the nickname "Hanoi Jane" among the veterans and POWs of the Vietnam War, some of whom hate her to this day. Since the 1970s Fonda has revamped her image several times over, rededicating herself to her acting career, becoming a fitness guru in the early '80s, and marrying billionaire Ted Turner in 1991. In 1988 she delivered a televised apology to Vietnam veterans and their families, a gesture that didn't mollify everyone, but established some distance between the new Fonda and old Fonda, whose actions, she finally admitted, had been "thoughtless and careless." As the '90s progressed, Jane Fonda's past was less frequently brought up as an issue and seemed to dwindle in importance – until 1999, that is, when Barbara Walters chose to honor the actress in a TV special called "A Celebration: 100 Years of Great Women." The announcement of the program – which aired in April of that year and which did, in fact, honor Jane Fonda – prompted an instant outcry from veterans and ex-POWs, many of whom vented their indignation via the Internet. Angry recriminations were posted in newsgroups, published in newsletters and on Web pages, and forwarded by email. Unfortunately for Fonda many of these email stories are only partial truths, heavily embellished by their creators. This page use to contain one of those stories. It has recently been pointed out to me that the two POW's Larry Carrigan and Jerry Driscoll quoted in that story, have both discounted the story as propaganda stating that they have never met Jane Fonda. Apparently bits and pieces of these texts, along with a few fabrications, were cobbled together by persons unknown to create the "Hanoi Jane" diatribe which still circulates on the Internet today. Only parts of it are true. ***At any rate, without proper verification of truth in either story, I have removed the cited email version from this web site out of respect for these two POW's. On the next page is a transcript of Hanoi Jane's 1972 "Radio Hanoi Broadcast", which is very true and an official part of the 1972 U.S. Congressional Record HR 16742. For the Record, It is my personal opinion that Jane Fonda was very much a Traitor and should have been tried for treason, not voted one of the Great 100 Women of the Century!